I love crafts a lot and I started my first project since I was a little girl. Now, I am a mom of 2 and I devote all my works to them. Kids should be all out for Summer Vacation now. My kids have been off from school and have attended Summer camp for almost 3 weeks already. Miss Porky really likes the summer camp as there are plenty of activities other than academics. She can spend a lot of time on arts and crafts, cooking and making fun stuff. At home, she continues to craft or draw almost every night. 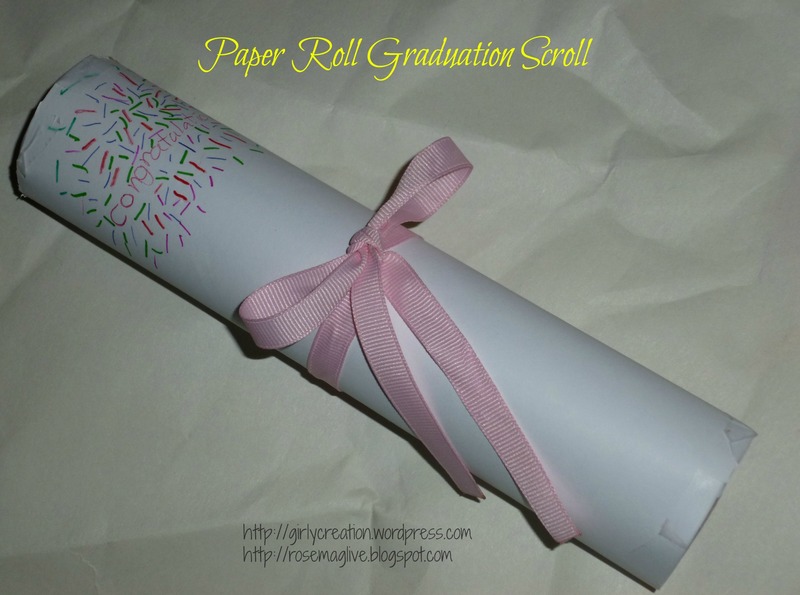 This week, she made a graduation scroll with a kitchen towel paper roll. It was 100% her creation this time. I did not even see her making it until she has 90% finished. Therefore, I don’t really have a detailed tutorial this week. Plus, it is very simple. 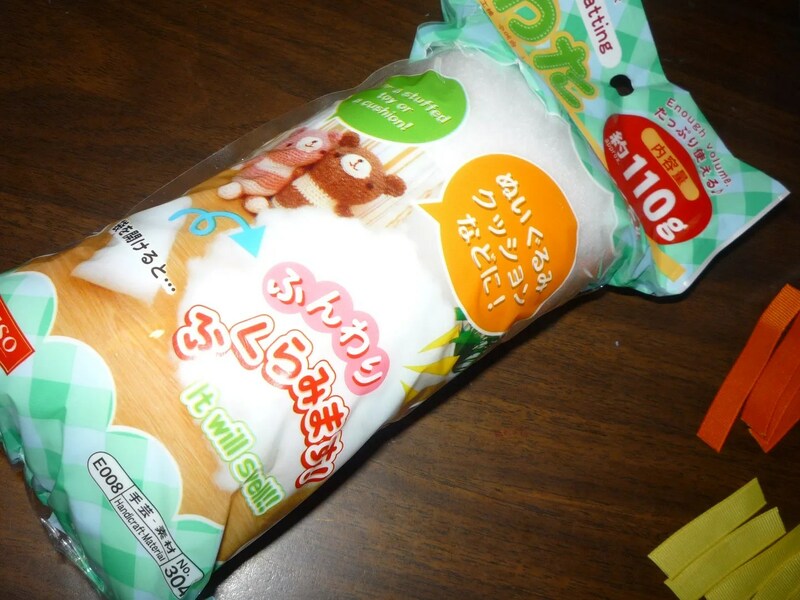 Believe me, Miss Porky is still too young to make something complicated. This entry was posted in Crafts and tagged Crafts, DIY, Festive, Paper crafts, Recycled materials, Ribbon on July 1, 2015 by Mag@GirlyCreation. Next Monday is Chinese Mid-Autumn Festival or someone call it Moon Festival or Moon Cake Festival. It is the most important festival of Chinese culture other than Lunar New Year and Winter Solstice. Chinese traditional festival usually relates to food. It is because there are certain kinds of food we Chinese eat in a particular festive season or day. For Mid-Autumn Festival, the featured food is Moon Cake. It involves a lot of processes and preparation which should be started one and half months ago. No kidding! It is! Salted eggs and molasses require more than a month to finish. Other than moon cakes, pomelo, trapa, starfruit and whole fish in sweet & sour sauce are some of the common food for Mid-Autumn Festival. When I was a kid, Mid-Autumn Festival means long weekend and chance to go out to play at night. Every kid would carry a lantern lit by a candle at night. There were many patterns and forms of lanterns. Most of them were made of paper and colored wax paper. In Chinese culture, Mid-Autumn Festival is a time for family reunion. Members who work or study out town would come back home to spend time with the family. The celebration usually runs for 3 days, the 14th of August in Lunar Chinese calendar (called Welcome the Moon), the 15th (Mid-Autumn Festival and also called Appreciate the Moon) and the 16th (called Chasing After the Moon). The moon during this period of time is a beautiful full moon and the lanterns would be hanged up as decoration. 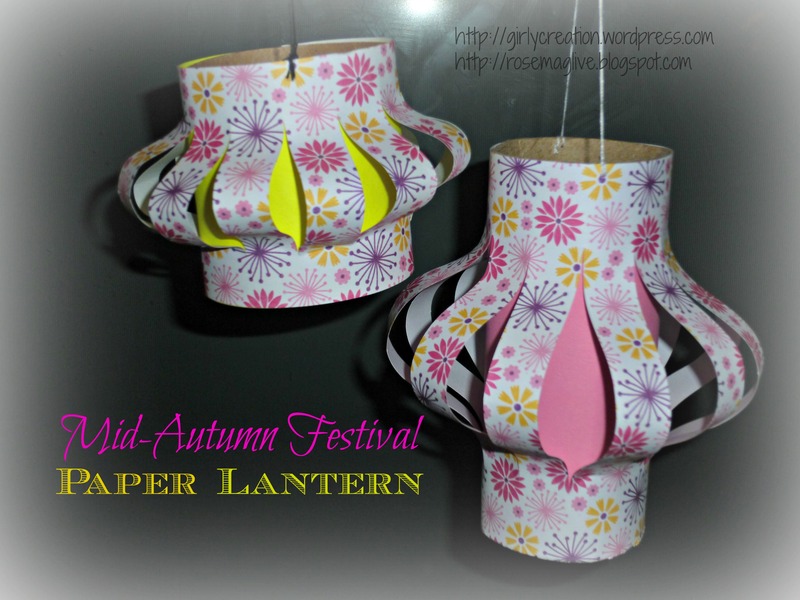 Okay, I am going to make a paper lantern with recycled materials and it is a simple craft that kids can definitely make it with little help from adults. 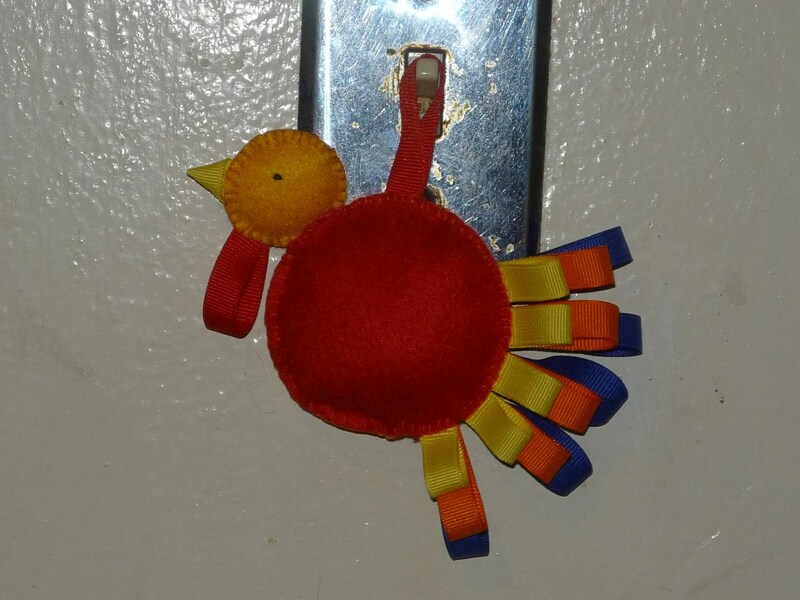 This entry was posted in Crafts and tagged Crafts, DIY, Festive, Kids' Craft, Paper crafts, Party Decor, Recycled materials, Threads on September 5, 2014 by Mag@GirlyCreation. 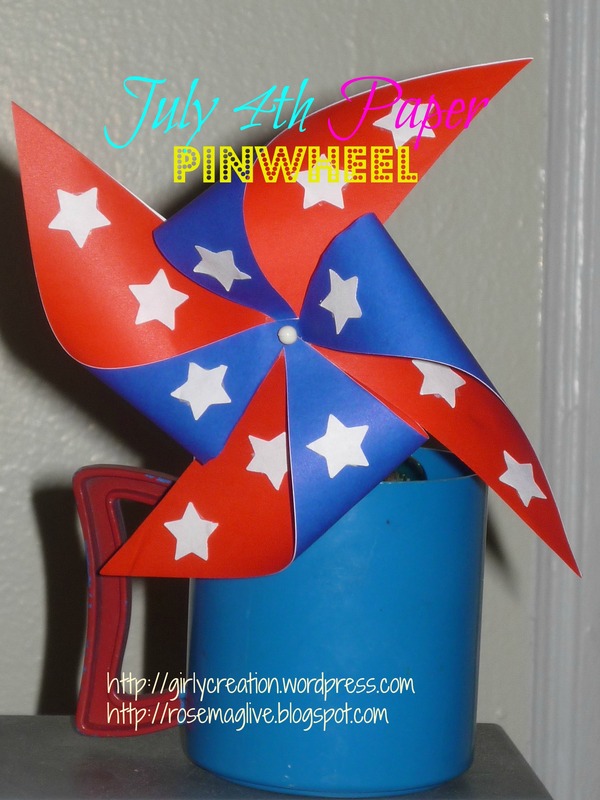 It’s July 4th today and it is never too late to make this simple paper pinwheel. My son saw it in the morning and he stared at it for a little while, then he took it and said to me, “thank you mommy!” He already knows that it is for him. 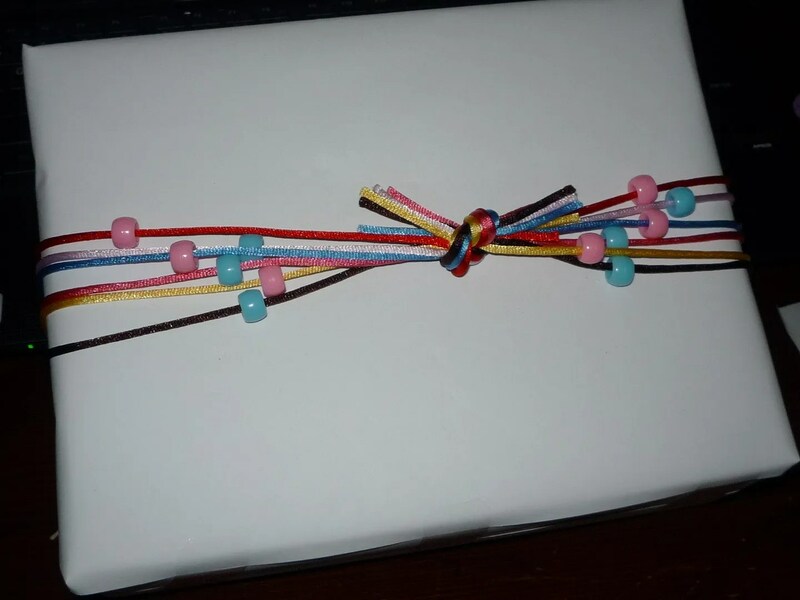 Daughter wants it too but since she has the pom pom hairtie, this is the turn for her brother. This is a very simple project that even kids can do it, just need some assistance if your kids are young as we need a pearl-head pin which is sharp on one end. This entry was posted in Crafts and tagged Beads, Crafts, DIY, Festive, Holiday, Kids' Craft, Paper crafts, Recycled materials on July 4, 2014 by Mag@GirlyCreation. I have joined a scrapbook/paper-craft group and we would exchange greeting cards during major seasons/occasions to practice different card-making techniques. It really open my eyes. 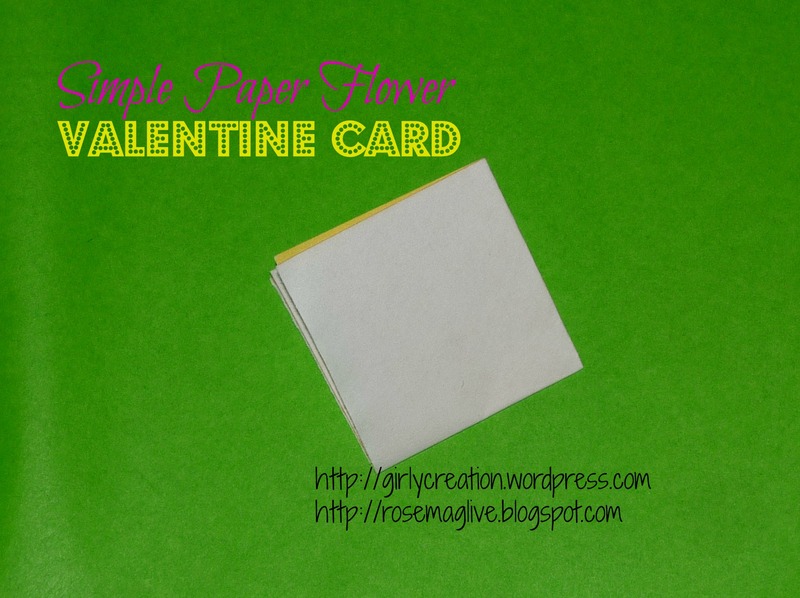 Card-making is not just making or drawing a plain card. It can be a pop-up card, a collages of multiple media, a box or just whatever you can imagine. 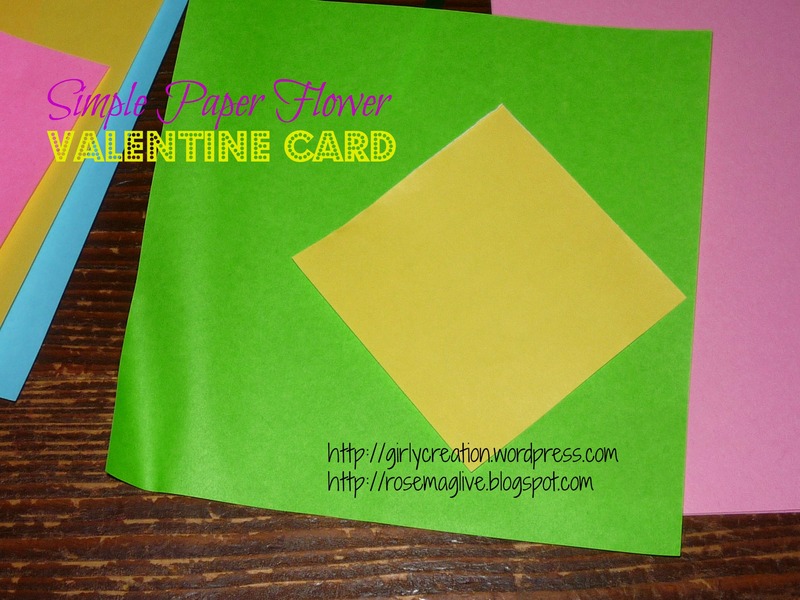 This time, I have to make a Valentine card using the technique of a box pop-up card. I have seen so many people in social networks making this card. But, I cannot share the card before the group friend receives the card. 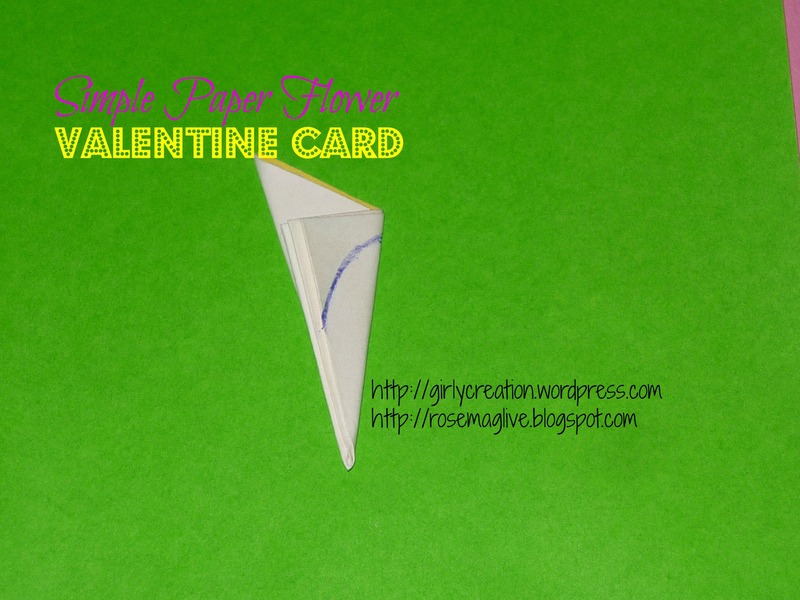 However, I have used a piece of item in that card to make another one which is very simple and fun to work with kids. I’m going to lead a project for my kids to make some cards this weekend. 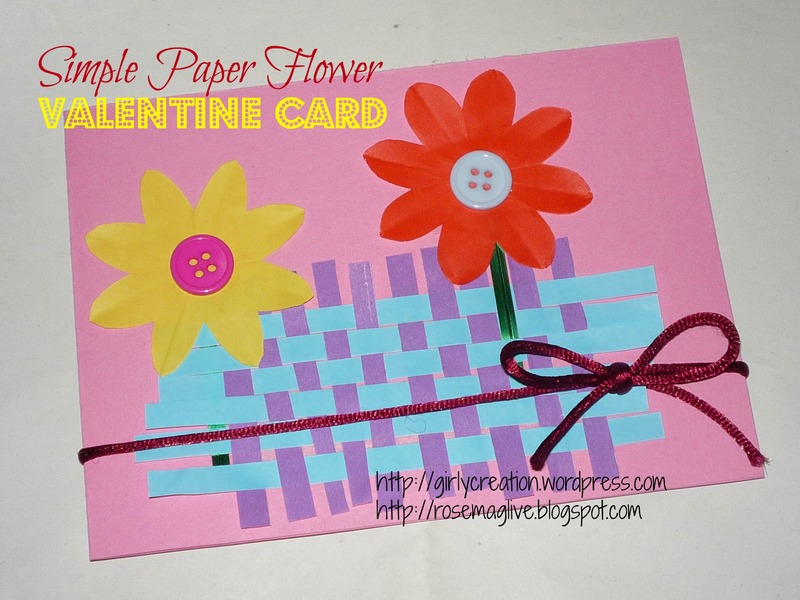 Let me share the simple paper flower Valentine’s Day card. A piece of string, I used the one people used to make Chinese knots. You can use a thin ribbon or lace too. 1) Cut a small square (whatever size does not matter, it just decides how big the flower would be), I cut out 4 squares from a piece of origami paper. Fold the square in half horizontally and then another fold in half vertically. 2) Fold the square in half again but diagonally this time, make it into a triangle. And then fold the triangle in half again. 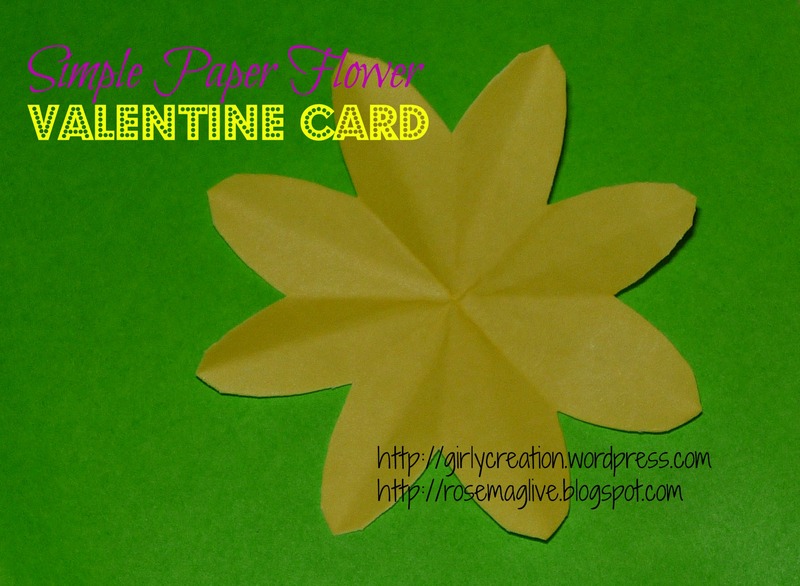 (look like below) Then, use a pen or marker to draw a curve to form a half petal. 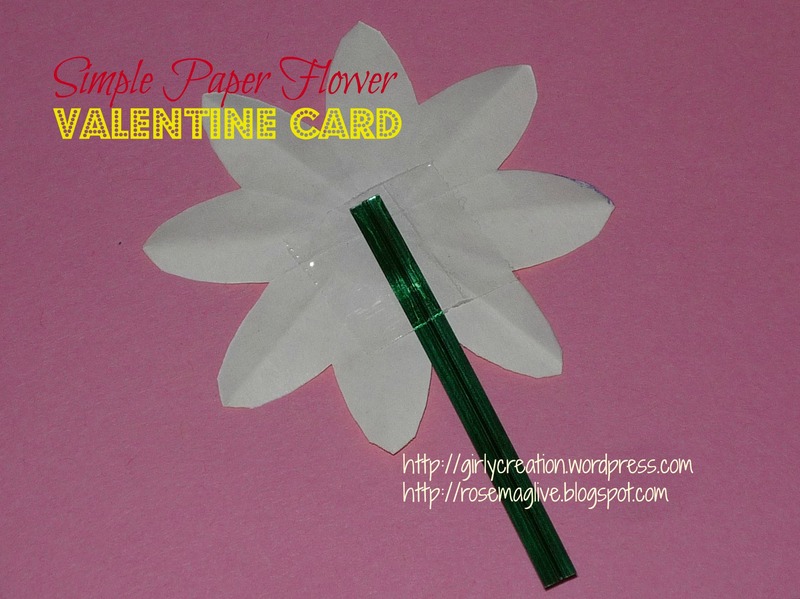 3) Cut the petals out and open up the paper square. You would end up having a paper flower with 8 petals. 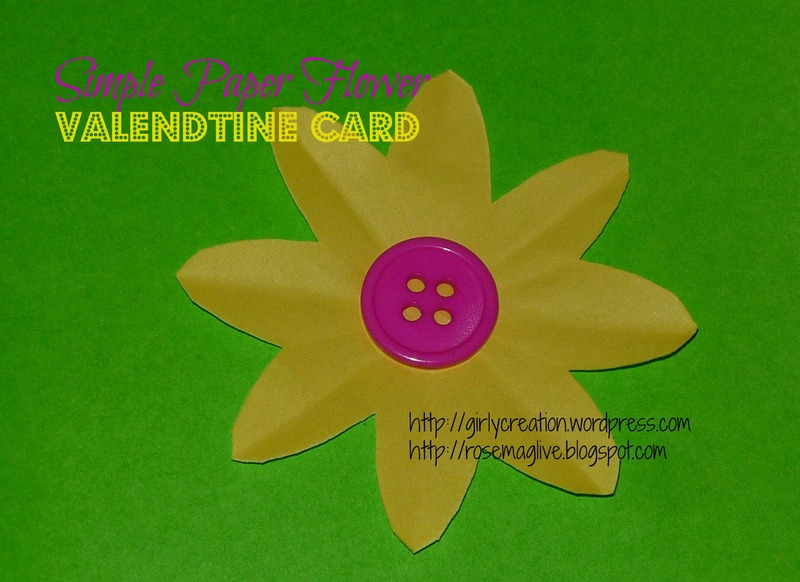 4) Glue a button in the middle of the flower. Use tape to stick a piece of gift wrap tie at the back of the flower as its stem. 5) Then, I cut out some paper stripes of 2 different colors and weave them into a fence. Arrange the flowers on the card. 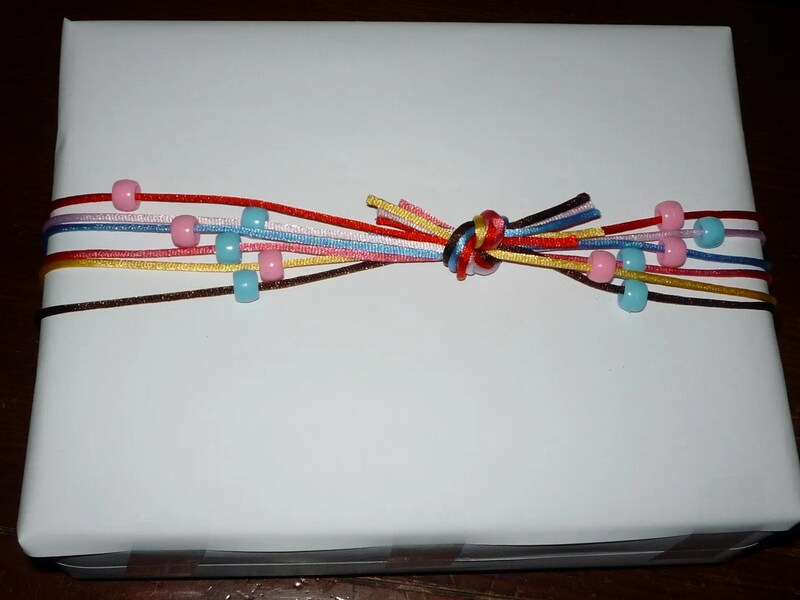 Tie a piece of string and make a bow on one side of the card. The card is now completed. 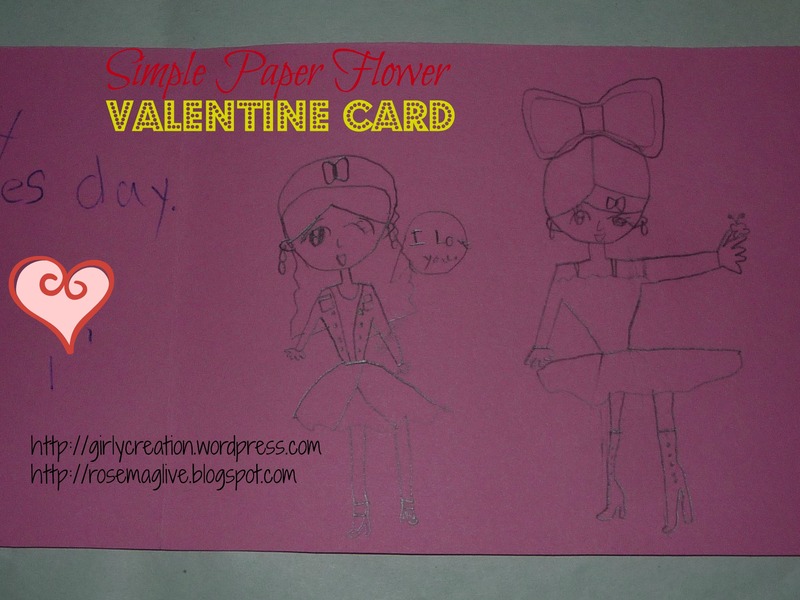 My daughter loves the card and she asked me to give it to her, She told me that she is going to give it to someone she loves as a Valentine. I asked her who she would like to give the card to. She told me to excuse her and she needs to write the card and draw pictures inside. 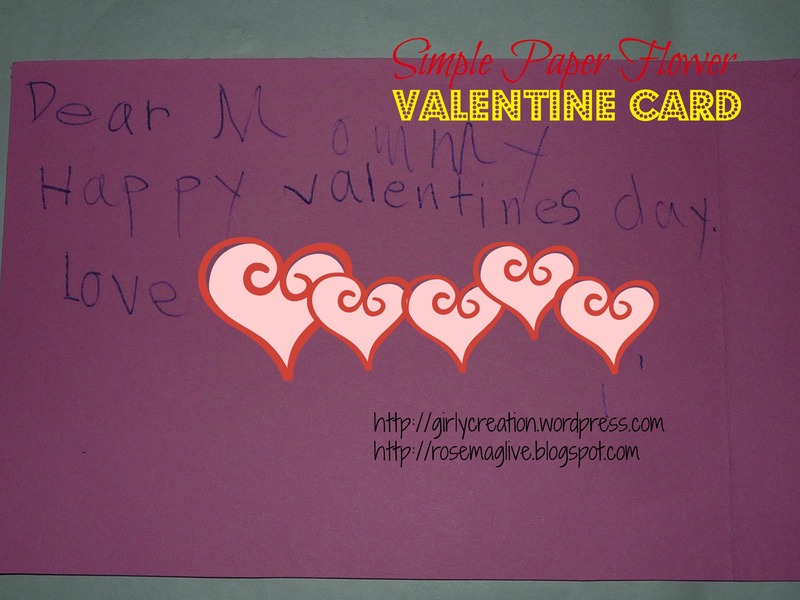 A while later, she presented the card to the one she loves – MOMMY! This is the inside of the card that she wrote and drew. Honey, I love you too! My dear daughter! P.S. My son and my daughter will be making more for their loved one this weekend. If I have time to take pictures, I would post their works later. Do you have a Thrilling Thursday craft to add? Add a link to your blog post in the linky below after you’ve left a comment on this post and add this button to your blog post! Please show support of handcrafting by spreading the love through pinning, tweeting and sharing in social media networks. Happy crafting! 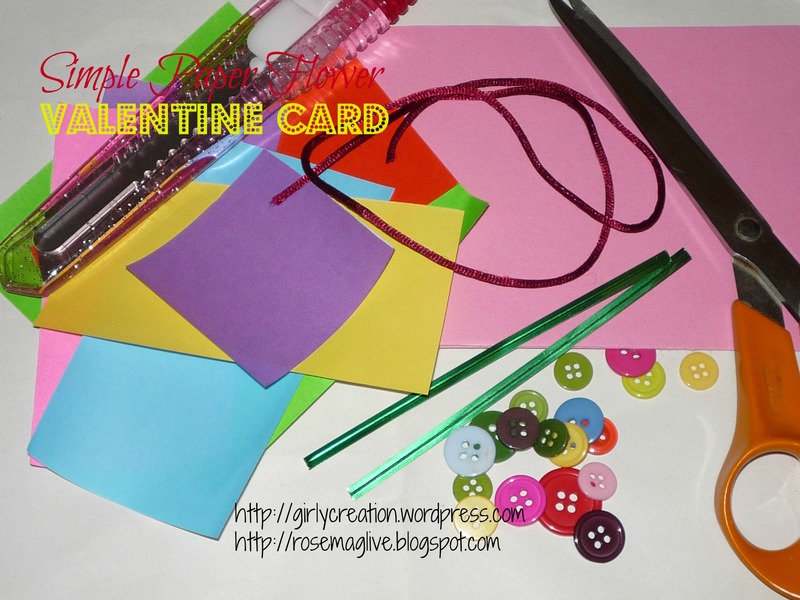 This entry was posted in Crafts and tagged Buttons, Crafts, DIY, Festive, Flowers, Holiday, Kids' Craft, Paper crafts, Recycled materials, Ribbon on February 6, 2014 by Mag@GirlyCreation. My daughter wants to be a Chinese dancer for Halloween this year. Being so busy recently, I am not able to spend too much time on preparation. Also, I don’t have a sewing machine (decide to get one in this Black Friday and fingers crossed for a good one at affordable price), every sewing project is a big one for me. Imagine how many stitches I would need to make for a dress, not considering the complicated embroideries yet. 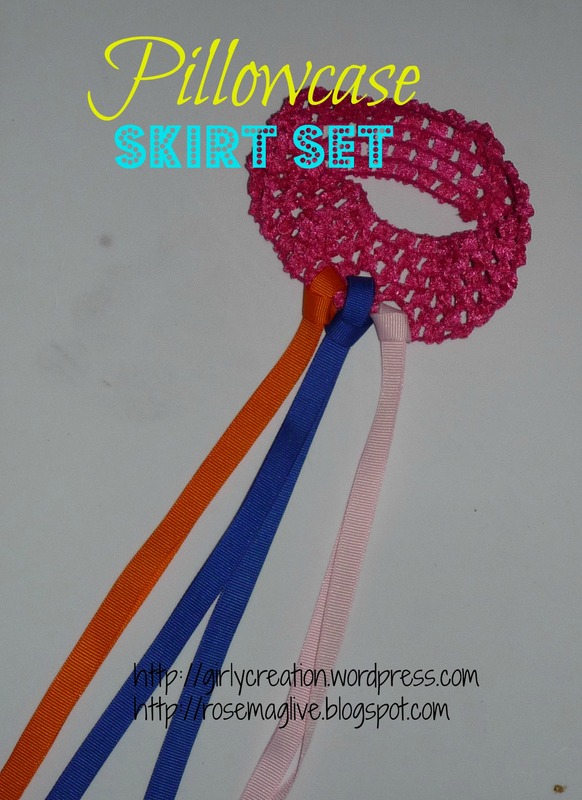 To make this project simple, I made a very simple skirt and a matching hairpiece. Daughter can wear a sweater that matches the color theme, especially the weather gets cold these days. 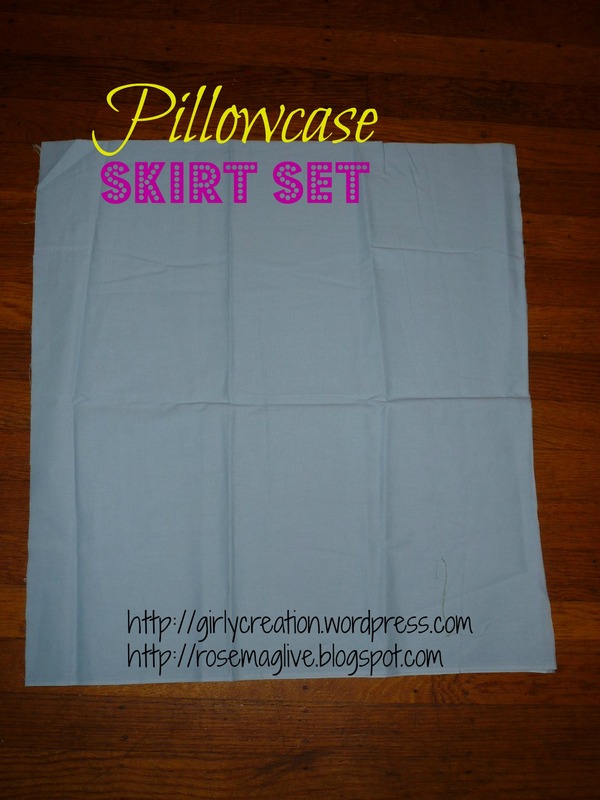 1) Cut out a long rectangle shape of fabric and fold over to the side and stitch the side together to form a long “ring” and the skirt is half-completed. 2) Fold down the top of the fabric, about 1 inch and stitch on the back of the fabric, leave about 1 inch without closing. Measure the waistline of the kid and cut an elastic band that long enough to wrap about the waist. Leave about 2 inches for making a knot. 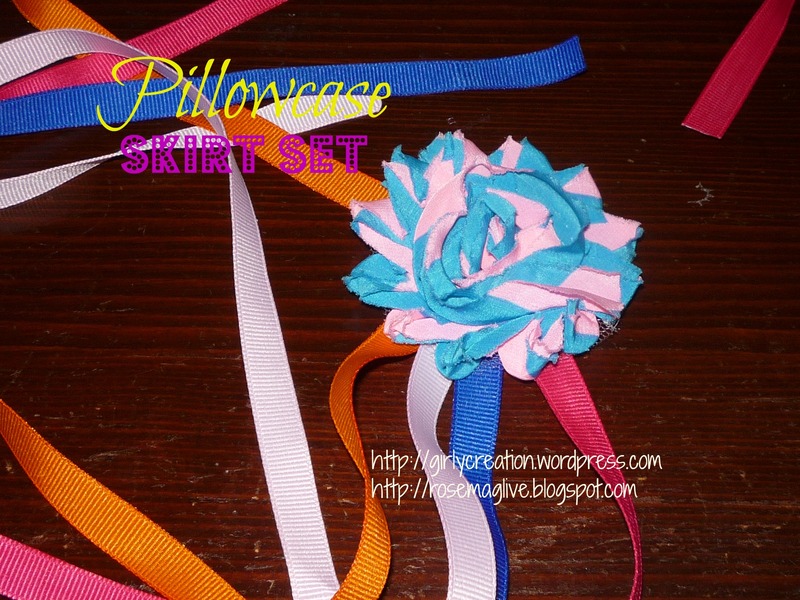 3) Decorate the dress with a fabric shabby flower and ribbons. 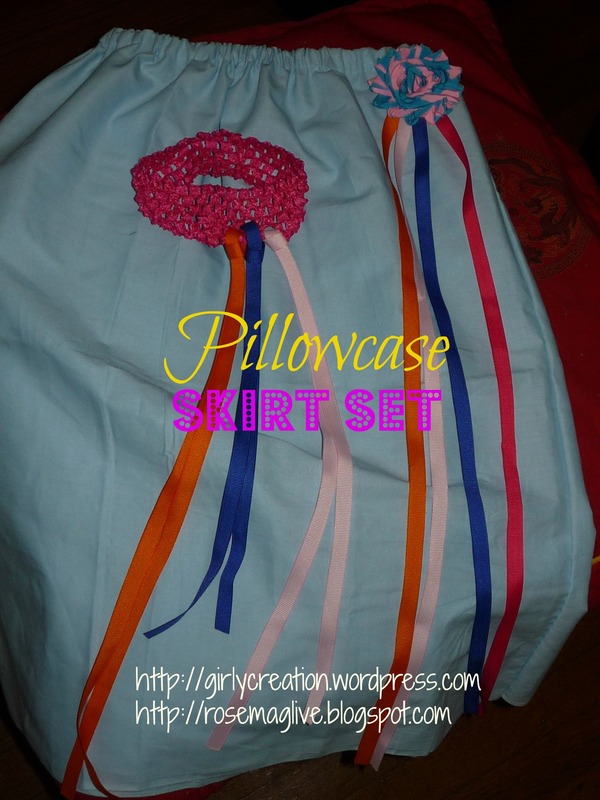 Ribbons need to be long enough to hanging down to the bottom of the skirt. 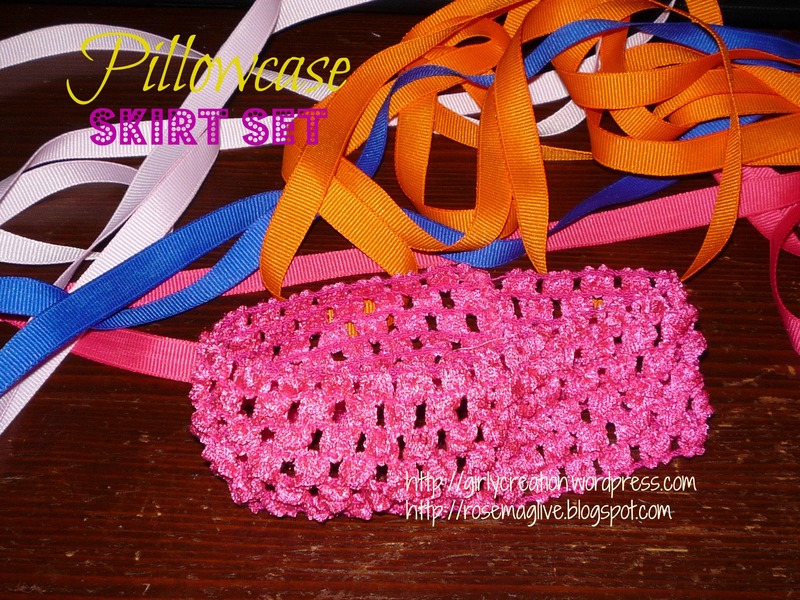 4) For the hairpiece, use a crochet headband and tie a few stripe of ribbons on it. Again, the ribbons should be a bit long to hang on the side to match the dress. It is not a perfect skirt but definitely a unique one that nobody would get the same one. The little model is asleep now and I cannot wait to see her wearing it tomorrow. Too bad that I cannot attend the school parade tomorrow as I need to work full day. Do you have a Thrilling Thursday craft to add? Add a link to your blog post in the linky below after you’ve left a comment on this post and add this button to your blog post! 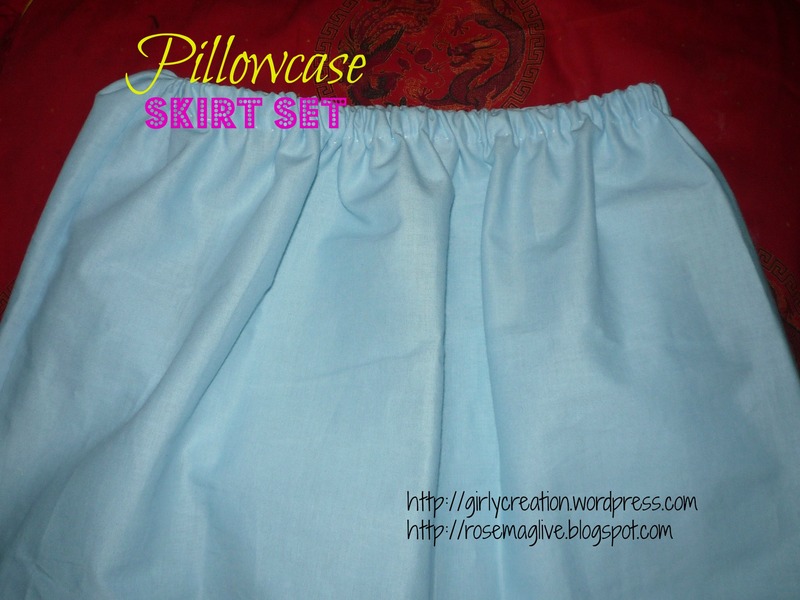 This entry was posted in Crafts and tagged clothing accessories, Costumes, Crafts, DIY, Fabric, Festive, Flowers, hair accessories, Ribbon on October 25, 2013 by Mag@GirlyCreation. It is a simple and cute gift wrapping idea for TBC Crafters Hop Thursday, particularly useful for preparing for holiday season. The materials needed are very simple and easy to find. I would recommend to wrap the gift with plain color paper, not wrapping paper with patterns because the idea itself would create unique pattern instead. 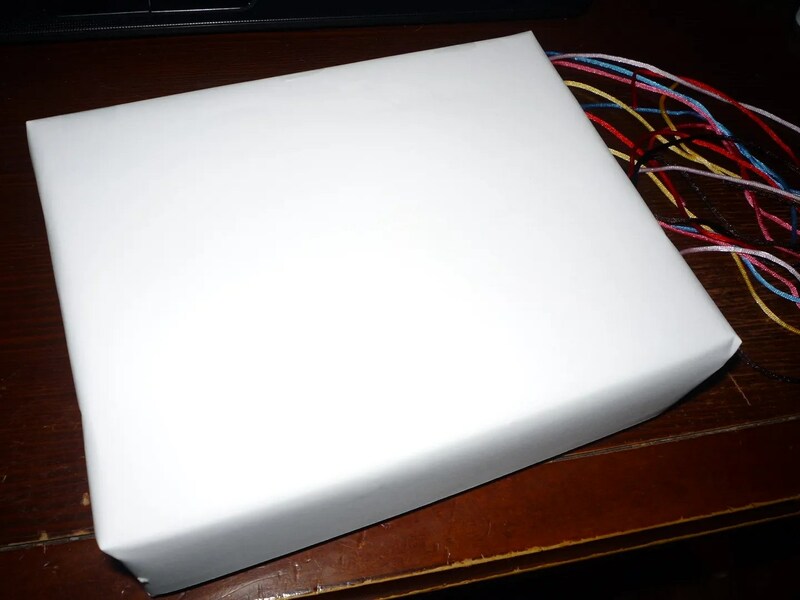 First of all, wrapped the box with some plain color paper. I used white here for easy demonstration. Secondly, cut the cords and put them underneath the box. 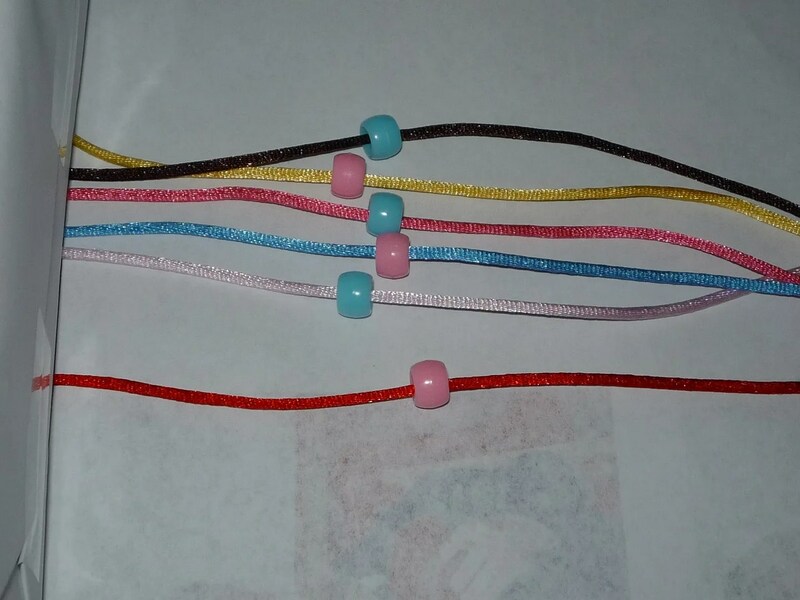 Insert one bead on each side of each cord . Hold all the cords and tie them together to form a knot at the middle of the box. Double knot is necessary to secure the cords. Arrange the cords and beads to show each of them. 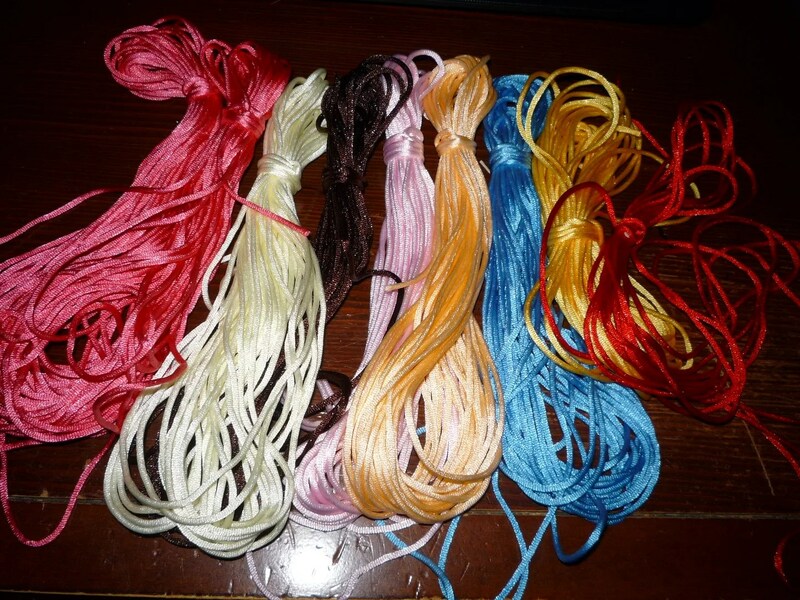 You can replace Chinese knotting beading thread cords with yarns, thin ribbons and also, you can use charms instead of beads for decoration. This entry was posted in Crafts and tagged Crafts, DIY, Festive, Holiday on December 13, 2012 by Mag@GirlyCreation. Time flies and it is time for the 2nd week of TBC Crafters Hop. Halloween has just passed and my family has a very good time, particularly the kids. Now, it is time to prepare for Thanksgiving. My kids’ school has already sent newsletter mentioning about Thanksgiving feast in school and holiday schedule. Although it may be still a bit early, there is no harm to set for the turkey. This is a very simple craft idea which only requires simple stitching techniques. The finish product is about 4-1/2″(H) x 6″(W) and you can adjust to make it bigger or smaller as well as the color combination. 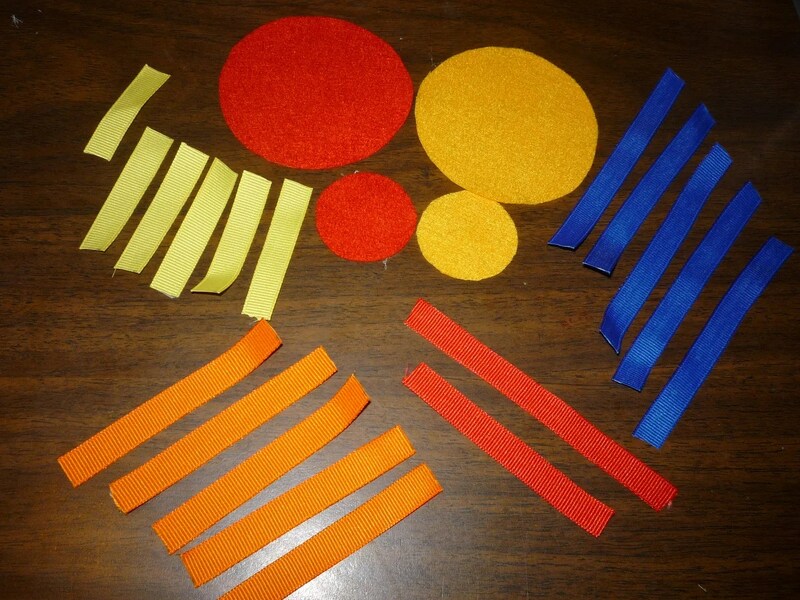 I used different colors of felt circles for clear demonstration. 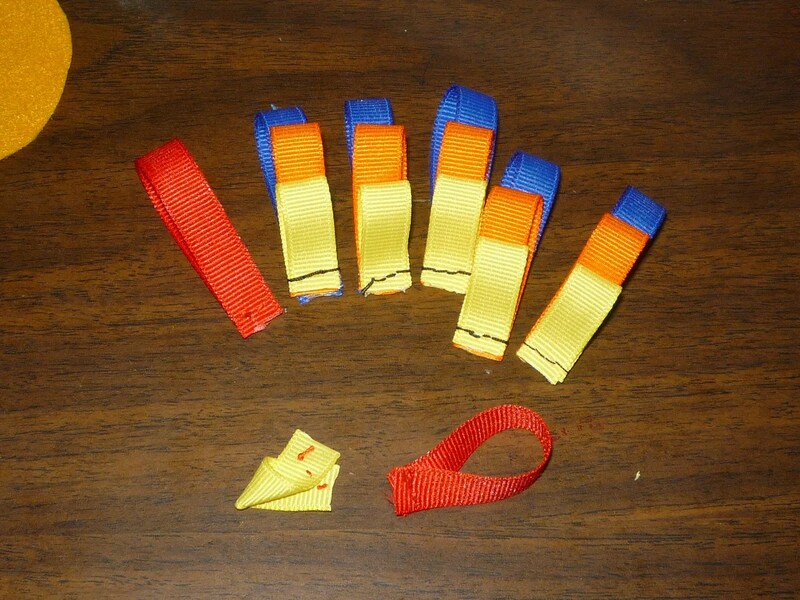 1) Fold the 2″ yellow, 3″ orange and 4″ royal blue ribbons into halves and use needle and threads to stitch all 3 pieces together in the order of 2″, 3″ and 4″. The stitches do not need to be perfect as they should be all covered and hidden when finished. The 3″ red ribbon also folded into half and make a 30 degree angle when stitching together. This red ribbon will be the turkey’s wattle. The 1.5″ yellow ribbon is twisted to form a triangle in the middle and it will be the beak of the turkey. 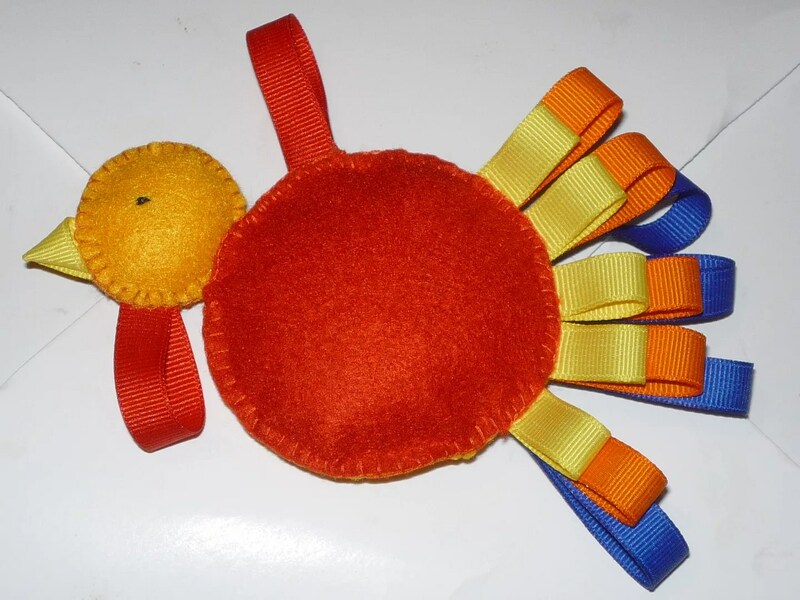 2) Put the 2 x 3″ felt circles together and starts stitching, then add the 4″ red ribbon on the top of the turkey body, then sew the 5 x 3-in-1 ribbons in between the 2 pieces of felt circles as the tails of the turkey. 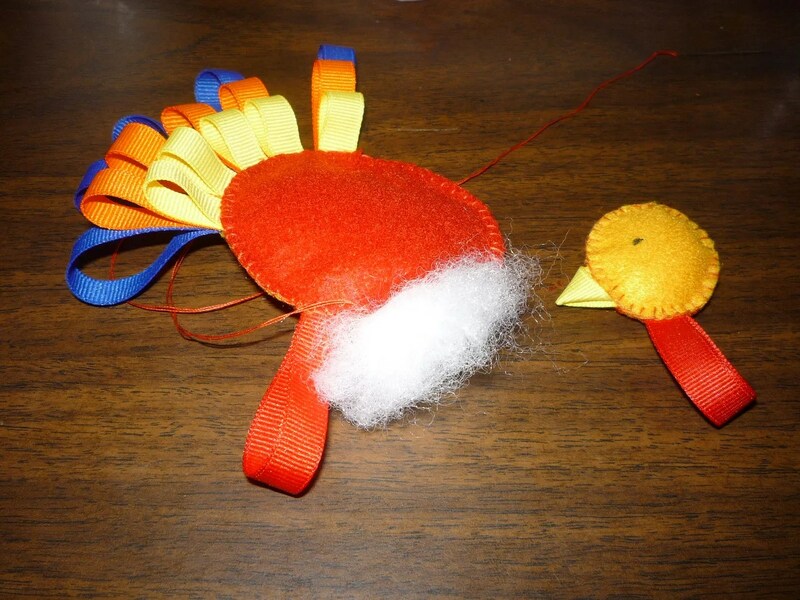 3) Use the 2 x 1.5″ felt circle to form the head of the turkey. 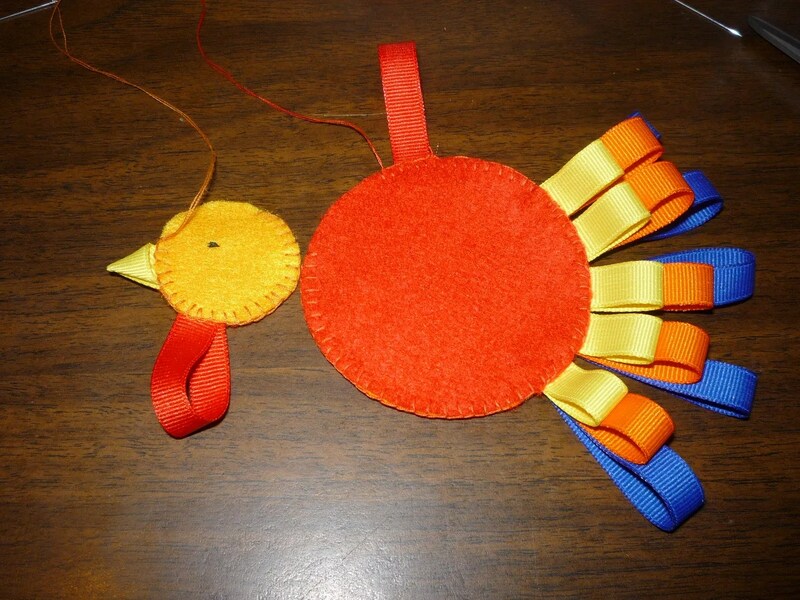 Use some black thread to embroider an eye for the turkey. 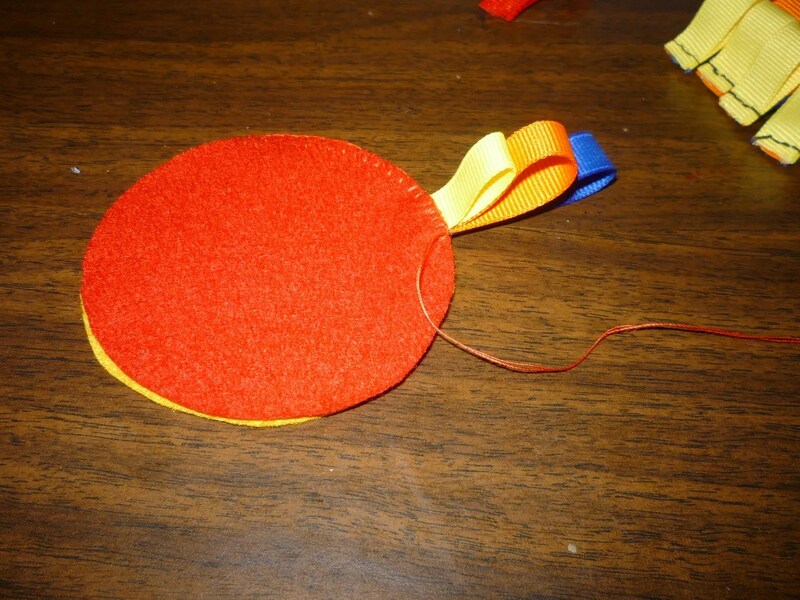 Sew the wattle and beak in between the 2 felt circles and leave about 1″ of opening. Stuff the batting into the head part, sew it closed after putting sufficient batting inside. 4) Stuff in the batting to the turkey body and stitch the head and the body together. This entry was posted in Crafts and tagged Crafts, DIY, Festive on November 8, 2012 by Mag@GirlyCreation.